For the first time, we have two of our writers reviewing the same home for sale. I found it interesting to read two perspectives on this home. Today, I saw a home in Northwood’s Park Paseo neighborhood that features a downstairs bedroom and a large bonus room upstairs. HOA dues are $85 per month and there are no Mello Roos. The house is nicely situated on a cul-de-sac and very close to a greenbelt. Children can walk to Santiago Hills Elementary School without crossing any streets. 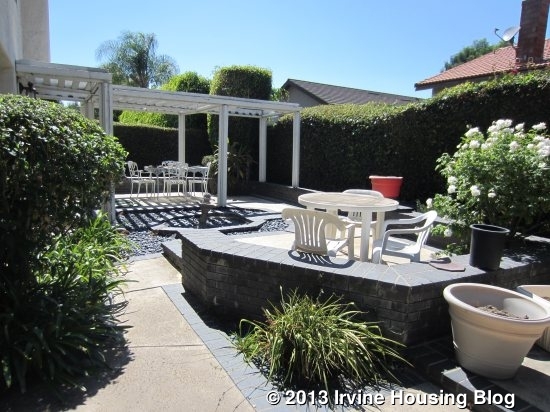 The home is also very close to the community pool, tennis courts and clubhouse. This house has a lot of potential, but can use a lot of work. The carpets are very dirty and the floors and walls are scuffed in many places. The ceilings have not been scraped and most rooms still have old windows. While all of the bathrooms have new faucets, no other upgrades have been made to the bathrooms or the kitchen. The first floor has a bedroom at the front of the house. It is currently used as an office and has large shelving units on two walls. The room has a small closet with mirrored doors. 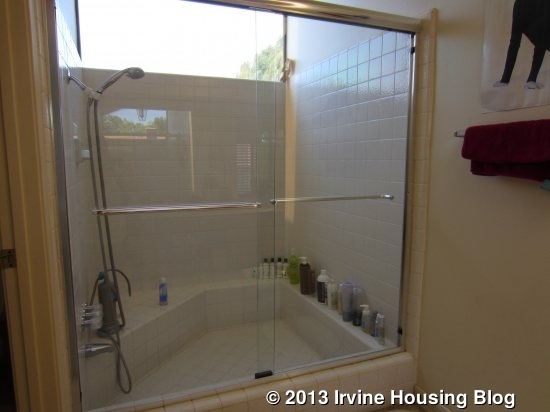 The adjacent bathroom has a single sink and a stall shower. The living room is a small step down from the rest of the house. It has vaulted ceilings and a white brick fireplace. French doors with access to the backyard were added. 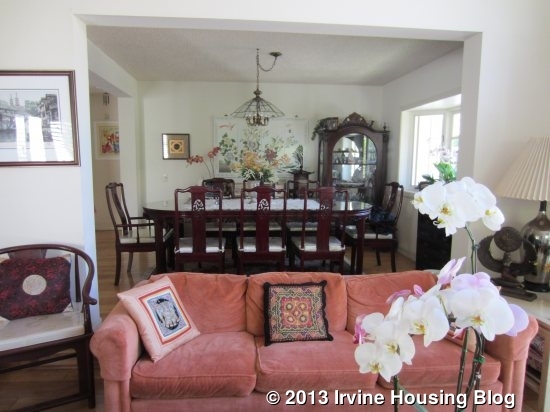 The living room opens to the dining room, which has space for a large table. A big bay window was added overlooking the backyard. 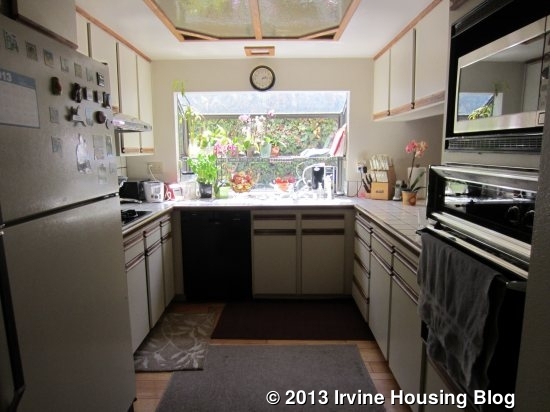 The biggest downfall of this model house is the kitchen. It is small, closed in, and really feels cut off from the rest of the house. The ceiling is low and still has the original panel lights. It also still has the original oven. 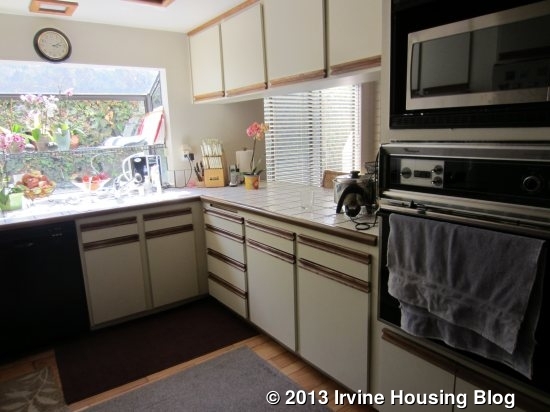 The counters are white tile and the cabinets are very plain. A garden window looks to the side of the house and doesn’t bring in much light. There is a small breakfast nook directly across from the kitchen that could hold a very small table, but it feels really cramped. 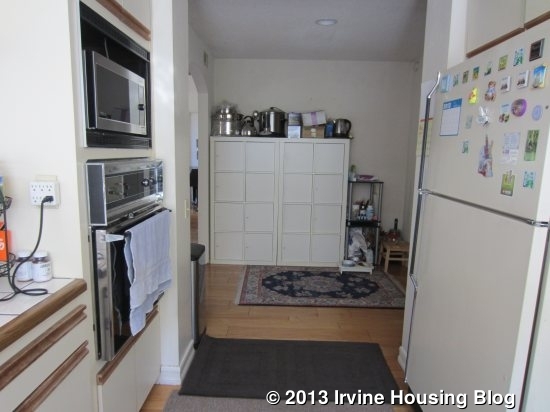 It has a pantry, but the pantry is hard to access if you have a table and chairs in that space. I have seen this model redone with the kitchen opening up to the family room and it makes a huge difference. The family room is at the back of the house. 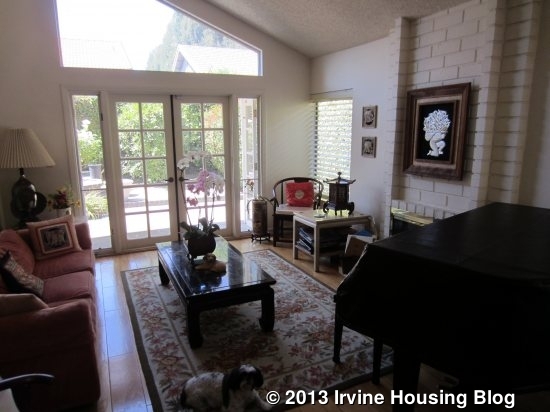 Like the living room, it has a white brick fireplace and doors to the backyard. 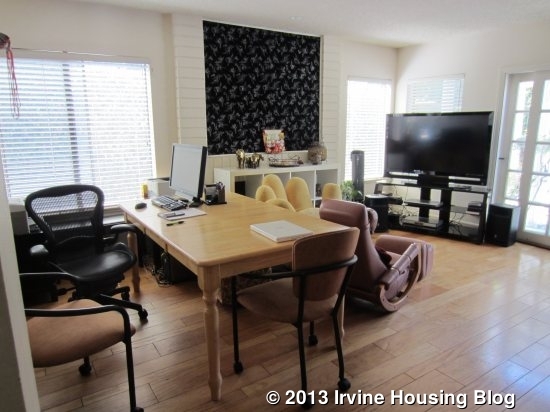 One wall has a huge built-in unit that can’t accommodate a TV. 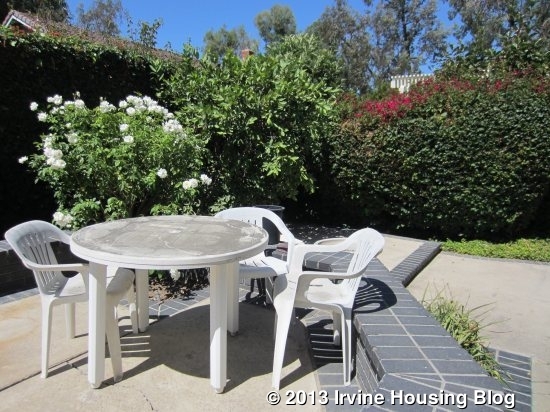 The backyard is fairly small for the neighborhood and is awkwardly divided into several areas. There is a covered patio area, a fountain surrounded by rocks, a raised area with a low wall around it, and an uncovered patio section with a step in the middle of it. 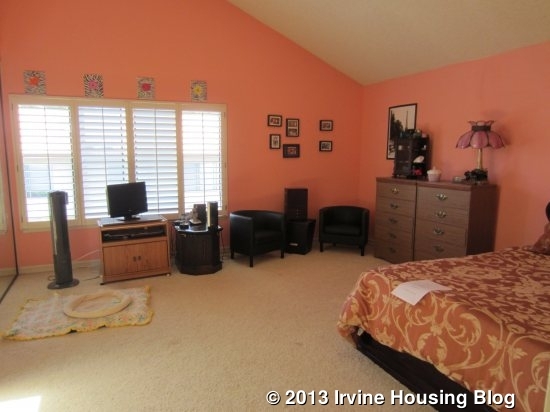 Upstairs, there are three bedrooms and a large bonus room. The master faces the back of the house and is a good sized room. 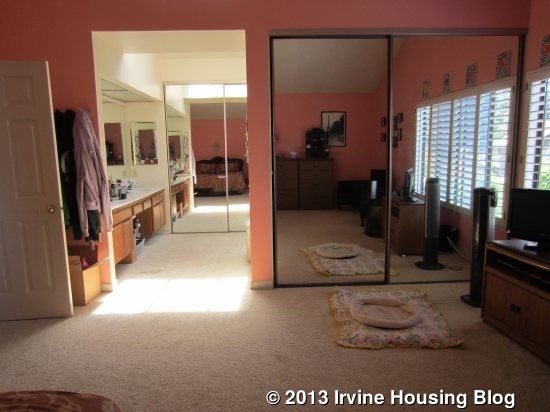 It has vaulted ceilings and, currently, bright pink walls. 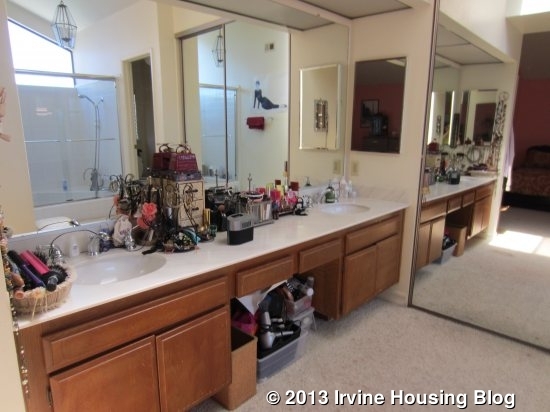 There are two different closets, each with mirrored doors. 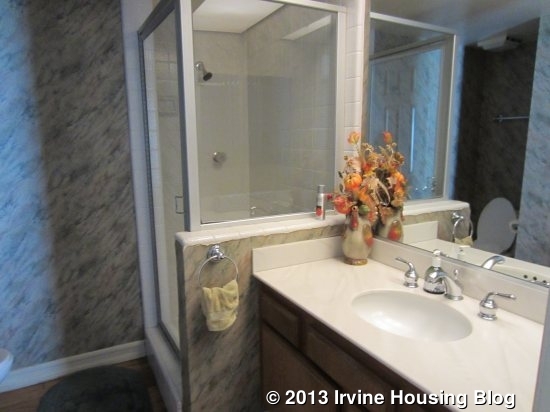 The master bath has two sinks with a vanity area in the middle. The shower is done in the original white tile and, though it technically doubles as a bathtub, it feels more like a shower. One of the other bedrooms has double doors and high ceilings. 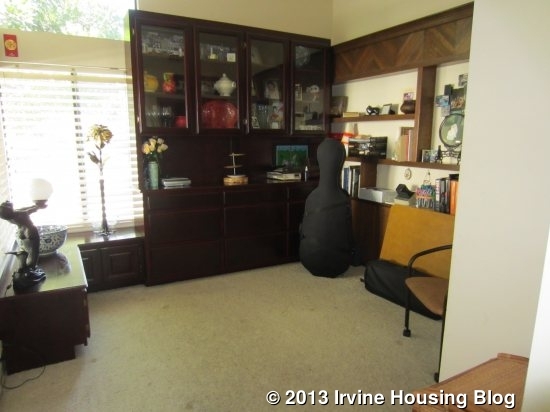 One wall is taken up by a three-door closet with very dark doors that make it feel very drab. 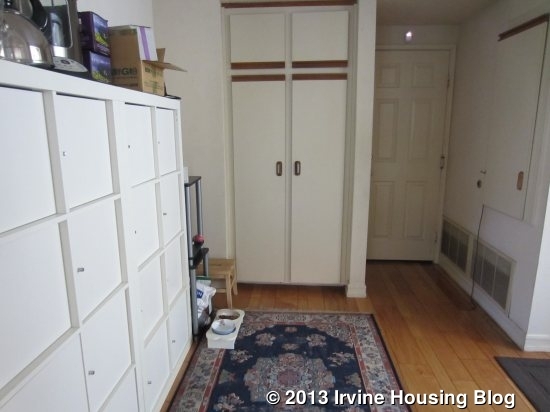 The other bedroom also has high ceilings and there is a small closet in one corner with mirrored doors. Both rooms face the side of the house and just have one window. The upstairs bathroom has one sink with a fairly small counter and a shower/tub combo. It’s pretty small and somewhat cramped. 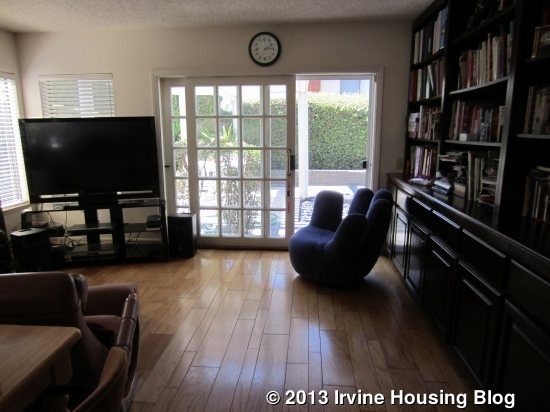 The bonus room overlooks the street and also has vaulted ceilings. Windows on three sides bring in a lot of light. There is a wet bar in one corner with an open storage space above it. The room offers a lot of flexibility and is a great extra space in the home. 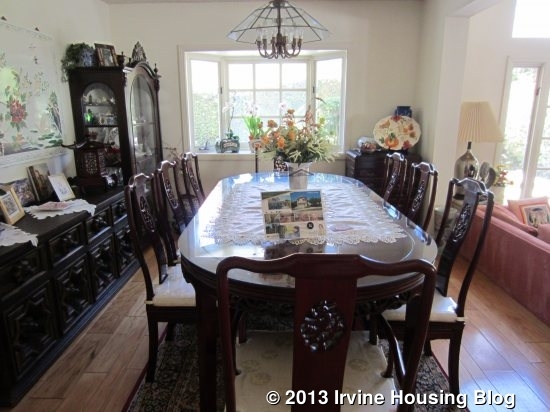 Looking at current listings and recent sales, the price for this house seems high. 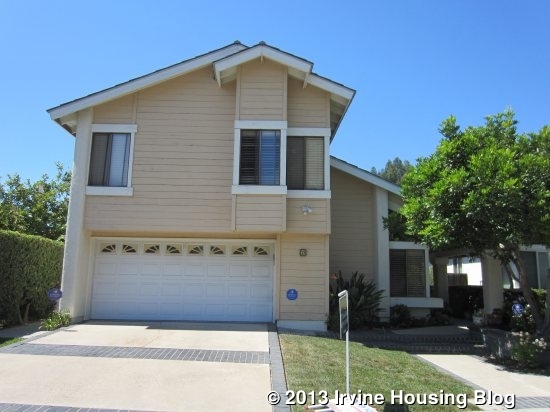 While I realize prices are going up, this one is not in line with the others, especially considering it has no upgrades. With a lot of work, this home could be really nice. 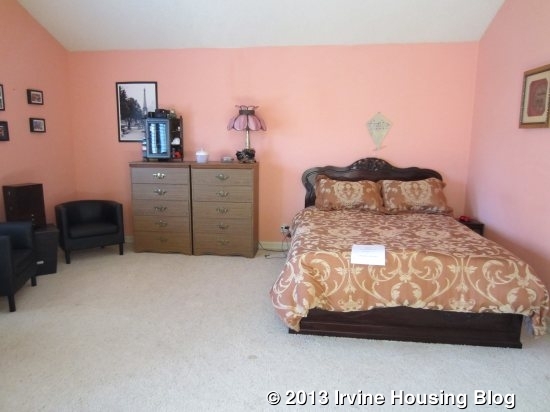 It is big and the downstairs bedroom will appeal to many buyers. Do you think it’s worth the money? Would you be willing to invest the time and money to fully upgrade this house? 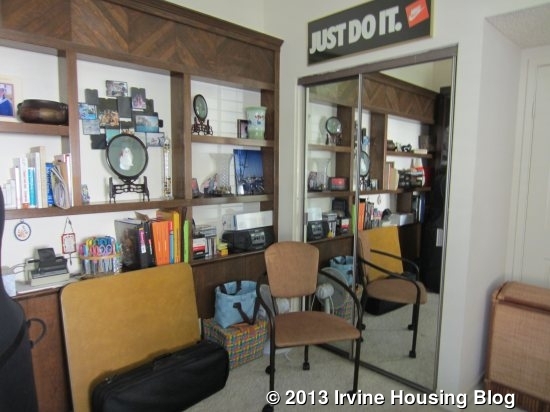 This entry was posted in Real Estate Analysis on August 30, 2013 by Karen.